31,00 EUR 19 % VAT incl. 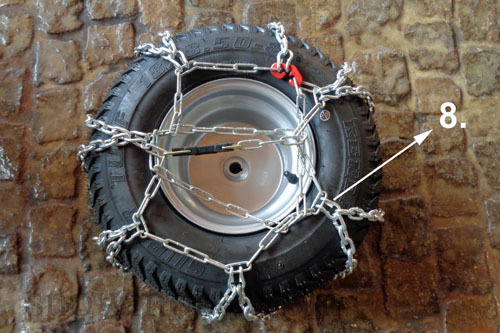 Slant track chains have traction than ladder chains. They are mounted quickly and guarantee safe working in winter! 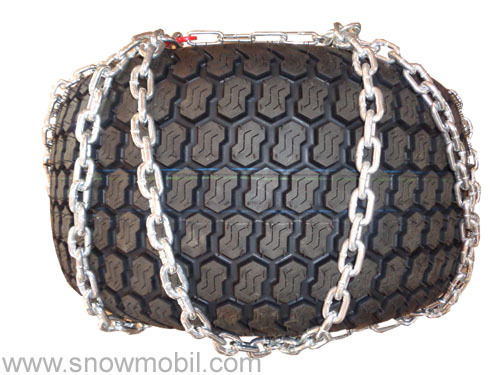 We offer you a set of snow chains with a chain tensioner. 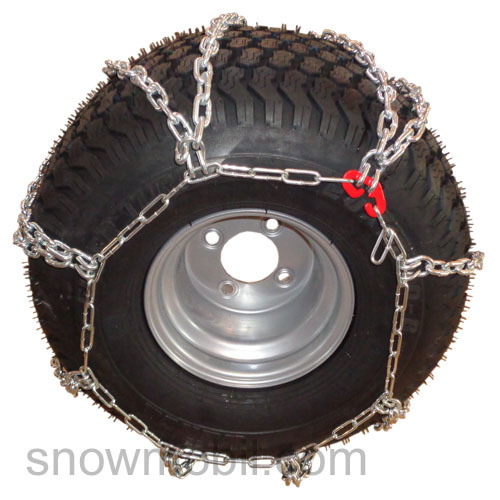 Scope of delivery: 2 pieces of snow chains with chain tensioner. The skew track chains are ideally suited for lawn tractors and ride mowers and are characterized by good traction. The chain link strength of the tread chains is 5 mm. 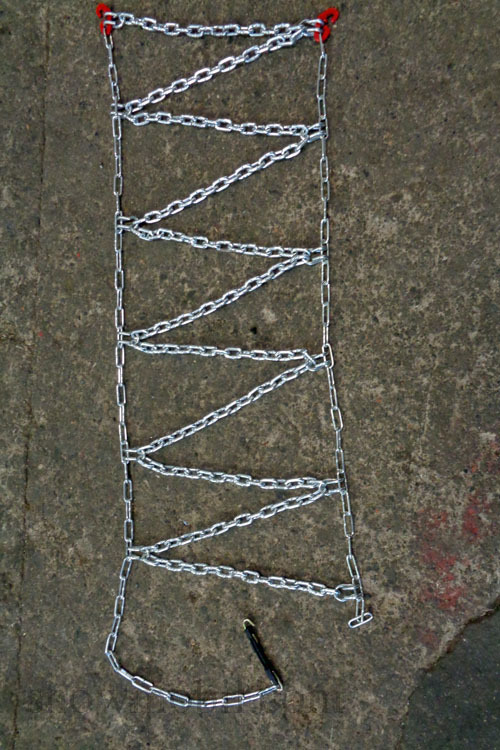 The lateral retaining chains have a chain link thickness 3,5 mm. The chain tensioner is slightly longer on one side. There is a rubber chain tensioner with a hook attached. Thus, the tensioning chain is pulled through the outer chain until you can hang the chain tensioner taut. This has the following background: The indication of the tire size is always the same. However, the tolerances at foreign tire manufacturers are significant. Of course, you can also work with which tire pressure. 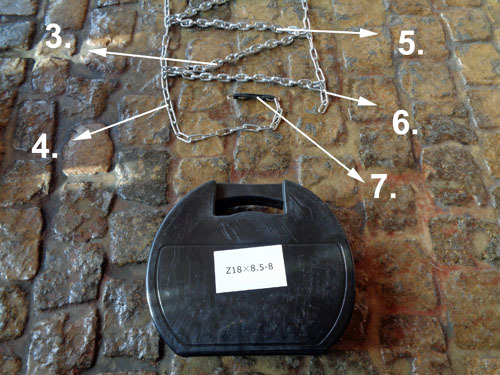 These tolerances can be compensated with this simple chain tensioning method. Why helical tail chains? 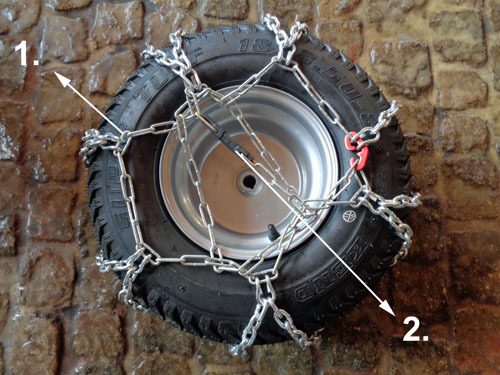 The ladder snow chains get caught or slip into the tire tread. The helical tracks are arranged diagonally to the profile and thus can not slip in between the tire tread. We buy these chains ex factory. We have been distributing these chains since 2000 in wholesale and retail. We guarantee a serious transaction - you have full return.